Necessity may be the mother of invention, but in some cases, scrap metal from the local scrap yard plays a pretty big part too. Take prodigy Kelvin Doe, who rose to internet fame in 2012 after news outlets reported on the tons of gadgets he’d built. They include a transistor radio, a studio generator and a battery to power his community radio station—all made exclusively from parts he found in the trash. Doe’s inventions were pretty remarkable, and they attracted the attention of academics and scientists at no less than MIT. But he’s by no means the only one building homemade contraptions out of items you can get at your local scrap metal yard. Ingenious inventors all over the world rely on scrap metal recycling yards as their chief materials supplier, building items that range from the whimsical to the practical to the downright astounding! Here’s a rundown of some of our other favorites. We love it when recycling and good deeds come together! Chinese DIY enthusiast Sun Jifa was in his early 20s when he lost both his hands in a fishing dynamite accident. Unfortunately, he couldn’t afford the set of expensive prosthetics offered by his hospital. So he did what any resilient DIYer would do: he built them himself. Over the course of eight years, Jifa guided his nephews to create a set of bionic arms that he can control with movements from his elbows. And the kicker? The handmade prosthetics were built with 100% scrap metal. Now, Jifa and his nephews have built over 300 sets of low-cost prosthetic limbs for people in need. Those are some real-life heroics! When Haitian builder Kosto Cadet wanted the car of his dreams, he wasn’t about to let his lack of funds hold him back. Instead, he used parts salvaged from the scrap yard—including a 125cc motorcycle engine—to fashion a working automobile that rivals anything you could find in a dealership showroom. Working over the span of a year and using money he scraped together from odd jobs, Cadet pieced the car together all by himself with only recycled car parts and scrap metal. We salute your ingenuity, Kosto! For some of us, The Iron Giant wasn’t just a fun way to pass a few hours. It was the depiction of a life goal. At least, that’s what we imagine was true for Tao Xiangli’s when he decided to build his giant humanoid bot. 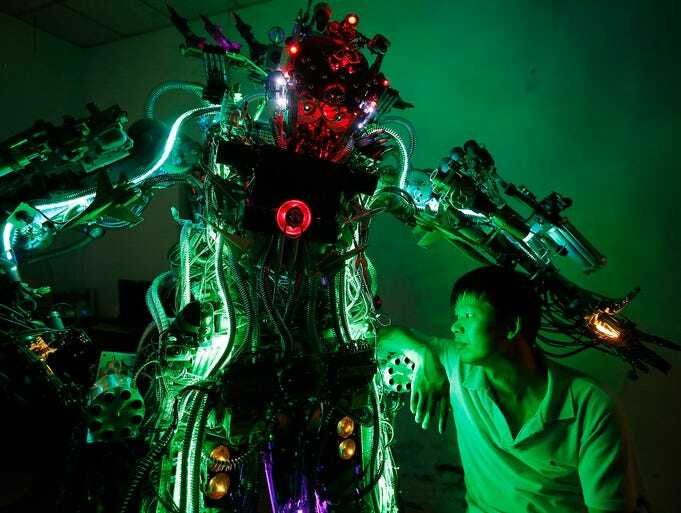 Known as the “King of Innovation,” the robot was built using scrap metal and electrical parts that Xiangli was able to find at his local scrap yard. And it can be operated by remote control. Overall, it cost just over $49,000 to build—not that you can put a price on robot friendship! Yolando Perez Baez is used to hard work. The 54-year-old inventor has spent years building and testing DIY devices to help his Cuban neighbors. But the aim of these scrap metal contraptions is decidedly practical: Perez mainly creates farm tools with the goal of improving the efficiency of manual farmwork and limiting his neighbor’s reliance on expensive imported tools. One of his most celebrated invention is a replacement starter for irrigation system engines, which feeds fuel to the engine with the help of a handmade oil rig. And of course, Perez only uses cast-off pieces scrounged from scrap yards and junk heaps. So, your local scrap metal recycling yard can be more than just a place to sell scrap metal. It can be a variable cornucopia of inspiration, design and ingenuity! Get inspired and come give us a visit.